Precision metal optics are now available from Valley's Metal Optics Group. Copper, Molybdenum, Nickel, Aluminum, Stainless Steel and brass are polished to a surface of less than 10 Angstroms. For critical optical applications, these materials may even be polished to less than 5 Angstroms. Using Aluminum optics rather than Nickel plated mirrors offers the benefits of lighter weight, lower cost, and more stability. 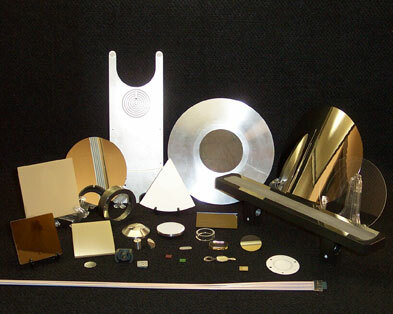 Super fine finishes are also available on many other semiconductor and optical materials such as Molybdenum, Silicon, Germanium, Gallium Arsenide, Indium Phosphide, Fused Silica, Pyrex, Optical Glasses, Ceramics, Sapphire, Silicon Carbide, Polymers, Crystals and numerous other materials including Stainless Steel wafers, substrates, and foils. Valley also stocks many of these materials.